Our in-town location provides great convenience! You can walk to Blowing Rock's famous downtown Main Street where you can find restaurants, shopping, garden parks and a great recreation park for the kids. The condominium features two master bedrooms, a quiet 3rd floor location, and plenty of nearby activities to please anyone. And of course there is always Blowing Rock's cool summer days at ~3600 foot elevation! Each bedroom contains a full bath and queen-sized bed. The master bedroom has includes a vertical dresser and armoire. The second bedroom includes a 32' HDTV. The living room's vaulted ceiling offers spaciousness that can only be had with a third-floor unit, a ventless gas fireplace, HDTV with DVD and a stereo with CD player. A nicely stocked kitchen allows you to prepare your favorite dishes and includes a refrigerator with icemaker, smooth-top stove and Bosch dishwasher (appliances new in 2008). Also included are a microwave, toaster oven, blender and coffee maker. The resort is less than one and a half miles to the Blue Ridge Parkway. From there you have easy access to the Parkway Craft Center at Moses Cone park (milepost 294.1) and its many miles of walking trails. Julian Price Memorial Park (milepost 297) is a few miles south on the parkway and offers a picturesque mountain lake and boating. Grandfather Mountain, with its famous mile-high swinging bridge, is about 15 miles south and also has a zoo and various mountain-top trails. A mile up Rte 321 is the Tanger Outlet Center and few miles up Rte 321 is Appalachian Ski Mountain and the Tweetsie Railroad amusement park. A little further is Boone, North Carolina, where you can find Appalachian State University (ASU) and a wide variety of stores and restaurants in its large commercial district. PETS: Limit one pet less than 25 lbs. Pet fee of $10/day. If bringing a pet, and since VRBO/Homeaway does not support per-day pet fees, I will need to manually update the pet fee and send you an updated quote. I'm originally from Long Island, NY but have been living in the Charlotte, NC area since 1992. I've worked in the technology field for 21 years and have two children who are finishing up their college years. We love the mountains and the condo location is ideal both for being so close to downtown Blowing Rock as well has the Blue Ridge Parkway and the many nature-related opportunities around Blowing Rock. Hotel-style in-wall HVAC unit in the main living area. The condo was very comfortable and warm. It was neat and in great shape.We were disappointed that the gas logs did not work. That would have added a very cozy feeling to the condo. The kitchen was well stocked and organized. The location was perfect with great restaurants around the corner. Our overall impression was good, and would not hesitate to book again. Location was excellent. We could walk into Blowing Rock, quick drive into Boone and surrounding areas. 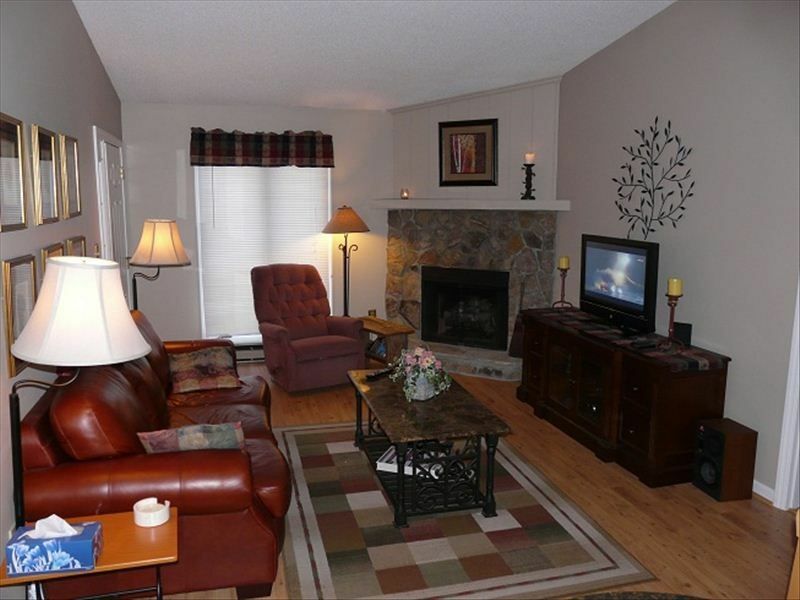 Well maintained condo in a very quiet setting. Especially liked both bedrooms had full baths. Owner available for any questions. We were so impressed with how well stocked the condo was with the every day things that you need, but don't necessarily think about...but the owners did! It was a very warm condo, and I really appreciated the touches for the Christmas season. Definitely would go back...loved the area too! This was a mutual location to spend time with family for Thanksgiving. Great proximity to the towns seasonal events. We will be staying here again. Wonderful little condo for getaway! This property was the perfect size for our three-person family to have a weekend in Blowing Rock. The place was quite clean and comfortable. The linens were fresh, and the kitchen is well stocked! The location is within a short walk of Main Street and is tucked away in a quiet section of town. We definitely would recommend this place! Please note that it is a 3rd floor unit with no elevator. This was not a problem for us, but does bear noting! All rates include cleaning fee. Exceptions are made for two night stays by adding a $75 cleaning fee to the nightly rate.